Hot on heels of the Nokia X6, the friendly folks at T-Mobile USA sent me a Nokia 5230 (Nuron) review unit! It’s easy to dismiss this phone as just a downgraded 5800 with the same stagnating OS (S60v5), until you realize that it’s both cheap to buy ($70 or less on contract) and cheap to own ($10 per month for unlimited data). 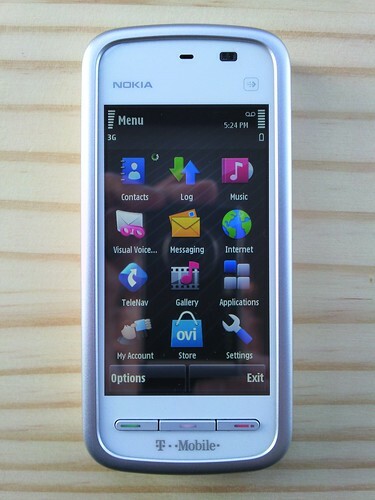 Symbian touch means you get apps like Ovi Maps, Mail for Exchange, Gravity, Qik Premium, and Skype (over 3G). How cheap to own is it really? a much more expensive voice plan to go with it ? No, same voice choices as the regular T-Mobile plans (Even More). I meant compared to the $10/mo. You’re being shortsighted… That $10 data plan will work on a Google Nexus One, a Nokia N900, or an HTC HD2 – all proper smartphones (with compatible 3G). Just swap the SIM! In fact, it will work on most other smartphones, like an unlocked iPhone (2G only). I’ve heard the $10 data plan won’t necessarily work on some smartphones (e.g. Android). T-Mo apparently detects if you’re using certain phones, and requires you to upgrade to the full smartphone data plan. With two 5230s in the family, I’m saving at least $30/mo compared to a pair of Android phones. A couple years of that and you’re talking real money. And the unlocked 5230 is $180, vs. over $500 for the Nexus One. Since I’m usually near a proper computer most of the day, I can get by without a proper smartphone. Then again, maybe they do it the other way around and exclude any IMEIs except the Nuron! did you find out that they aren’t excluding N1 or other non tmo phones from using the 10$ plan? The Nuron SIM works with my Nexus One. They aren’t detecting anything, the internet is $10. The key is only for phones, not smart phones. I guess the small screen on the Nuron is the reason for the cheap internet. If tmobile recognizes your phone as a smart phone you’ll be paying the full $30, if it isn’t a tmobile phone $10 plan is all good. I’d watch out with that nexus one though or any android phone because they can easily monitor that. Does Skype work on this phone? The Skype link you provided in your writeup shows that Skype works for the 5320… not the 5230. Use the link I provided – the Nuron is the 5230, but is often typo-ed as the 5320. It’s not so important which device you pick, as long as it’s Symbian S60v5 compatible. So basically, most apps for the 5800, 5530, N97. N97 mini, and X6 will just work on the Nuron! What’s the link that u mentioned u provided for Skype to work on Nuron 5230? Can you provide again? Oh my goodness, thank you SO much!!!! I couldn’t find skype anywhere for this nokia 5230! and here I found you!!! Appreciate it a lot!! This link is working fine! The link works fine – see above. This is pretty old news at this point, but I want to let you know that the $10/mo data plan does NOT work on other smart phones… not longer than a couple weeks at any rate. I got a n900 and it worked fine for about 2.5 weeks before putting up a web page saying “your data plan does not support this device” or some such thing, requiring me to upgrade to the $25/mo (contractless) or $30/mo (contract) plans.